When I first became a mother I had very strong ideas about what kids should eat and I was convinced that my child would be a foie gras-supping gourmand who would relish fare like roasted duck with raspberry star anise glaze. Marc did eat most things for a while, but then one day he turned fifteen months and it all ended. I gave him pumpkin and thyme risotto cakes and he gave me the finger. His menu dwindled progressively down to barely more than plain pasta and bananas, he even refused Vegemite on toast. So I set about working out ways of getting my son to eat a more varied diet and one of those ways was working out recipes which had vegetables hidden in them. Initially I tried grating carrot and zucchini into the meat sauce but this was met with suspicion and even more rejection. Finally I had the idea simply to puree the vegetables and add them to the meat and voila! The toddler couldn’t tell the difference between a conventional lasagne and my doctored powerhouse-of-veggie version which was in fact 50% veg. I experienced triumph and smugness, both in the same moment. (Pic: my son the fussy eater Marc Colwell, 3.5. 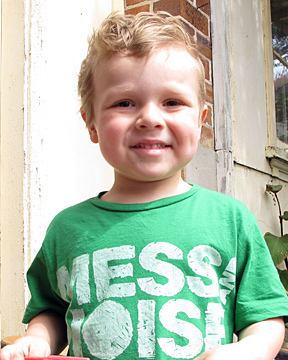 His t-shirt sums him up perfectly). Whilst I am on the topic of lasagne, the dish and I go back a long way. 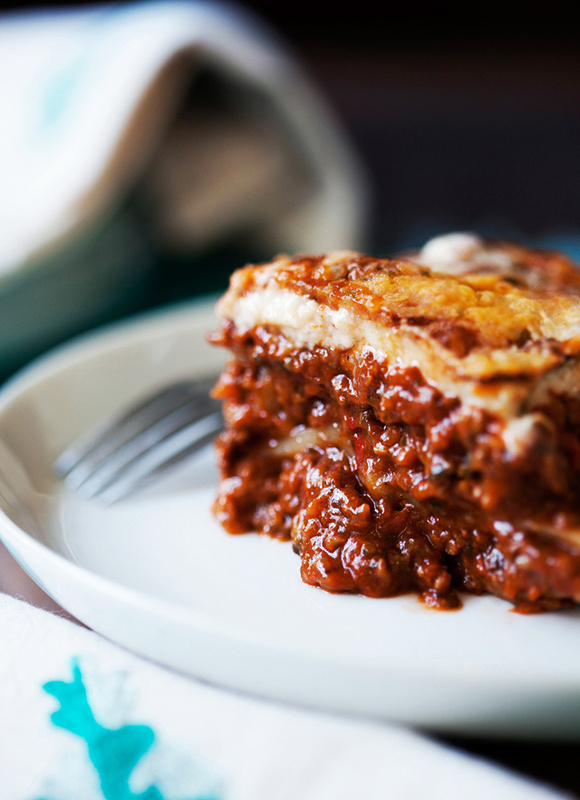 When I think of lasagne it stirs up feelings of my own childhood comfort food favourites with all that gooey cheese, rich tomato-ey meat sauce between layers of soft pasta. I mean, what kid doesn’t love that combination? Even Garfield the cartoon character cat loved it, and I loved him. At my insistence (or Garfield’s) my mum was able to make and still does, a whoppingly good Bolognaise sauce but funnily enough it rarely if ever, made it into a lasagne. As lasagne wasn’t something we had as a staple at home, it was something I always ordered when eating out. 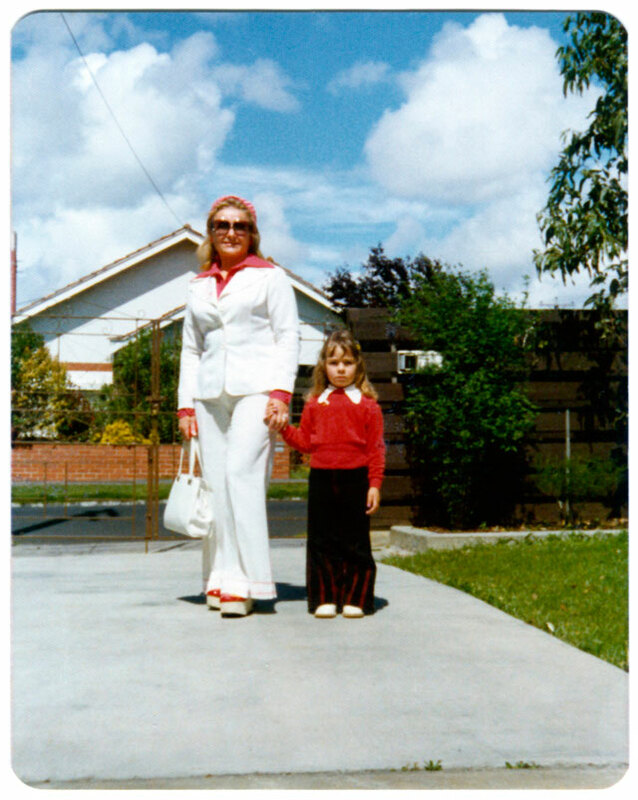 Mum and I used to get dressed up and she would take me to Rob’s Carousel, a popular family restaurant in the 70’s in Melbourne’s Albert Park, where I would always order the same thing: beef lasagne followed by chocolate mousse.Now at the tender age of six or seven I wasn’t exactly a fine dining aficionado, and even though it still has the reputation of being the worst restaurant in Melbourne’s history, I believed Rob’s was magical. There were linen tablecloths, lasagne was on the menu and best of all it actually revolved (hence the word carousel in the name), a feature which was highly novel at the time. Rest assured that for me Rob’s was about as fine dining as it got, and the lasagne was always very tasty. So here goes, the recipe has three separate elements so read on. This makes a large deep lasagne approximately 20x30cm (8×12″) and you can always make a double batch if you want to freeze one. Makes one large 20x30cm (8″x12″) lasagne. Prep time: one hour for all three elements. Cooking time: approximately three hours, (with a pressure cooker this is halved). *I am a huge fan of Herbamare salt, the Dr Vogel product available at health food shops or in the health food aisle of the supermarket. It is a combination of natural sea salt infused with organic herbs and vegetables and it only contains the good salt and veg. It is now a staple in my cooking as I find it just adds that extra bit of flavour to my food. 1 quantity of bechamel sauce, see recipe below. 1. Place all your veg into a food processor (I use a Thermomix) and process until it is just short of a puree (see pic below). You don’t want to over process as it will turn into vegetable juice, yet you want a little bit of texture left to the veggies. 2. Heat a tablespoon of olive oil in a heavy base pan over medium heat and cook the veg puree, stirring until it goes slightly darker, approx. 3-4 mins then cook for another 10 minutes continuing stirring to make sure it doesn’t stick to the bottom. I recommend the use of a Simmer Mat, it really does make a difference. Set the puree aside and move onto the meat sauce. 1. Using the same pan add oil again and cook your mince until it is browned adding the bay leaves and herbs. I usually add the Herbamare salt and some ground black pepper at this stage. I love adding herbs and spices to mince meat as I don’t like the raw “meaty” flavour or smell that accompanies it and they do a wonderful job of removing that flavour and replacing it with a gorgeous herby one. Incorporating the veggies and meat. 2. 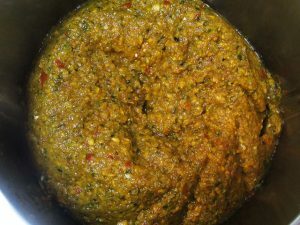 Add your cooked veggie puree to your meat, stir right through until thoroughly combined. Add the jar of passata and the tomato paste and stir right through. Cook for approximately 90 minutes on low heat with the lid on as you want the veg/meat to reduce to create a ragu-style sauce. The sauce needs to be cooked for this length of time for the vegetables to incorporate into the meat and become less vegetable-y. If you own a pressure cooker, this is one of those times they are invaluable. A pressure cooker at this stage is incredibly handy as it reduces the cooking time to only 25 minutes. If using one bring cooker to high pressure on full heat, then reduce heat bringing cooker to low pressure and cook for 20 minutes. Natural pressure release method. 3. After cooking taste the sauce to check acidity. If it is too acidic add the teaspoon of maple syrup or sweetener. I like my tomato sauces slightly sweet so I sometimes add a little more. If your sauce isn’t as thick as you would like, dilute a heaped teaspoon of tapioca starch in half a cup of water and slowly add it to the sauce stirring well with the heat still on. 1. Place all your ingredients in a deep heavy base saucepan and put heat on medium, whisking constantly for six minutes. The sauce will take 6-7 minutes to start thickening. Once the sauce has started to thicken, reduce heat to low and continue to whisk slowly for another six minutes (12 minutes cooking total). If your sauce is too thick slowly add more milk to thin it out whilst whisking. You should have perfect lump-free bechamel. Chop your eschallot at 5 seconds on speed 5, scrape sides. Add milk, flour, butter, bay leaf, nutmeg and salt/pepper. (Do NOT add a bay leaf as I once did and ended up having to put the sauce through a sieve to get the bits of leaf out.) Cook for 12 minutes @ 90 degrees at speed 4. Gluten-free flour mixes work well. 1. Pre-heat your oven to 200 degrees celcius (approx 400F). Ladle the veg/meat sauce into the bottom of your baking dish then top with pasta, veg/meat sauce again, pasta, veg meat sauce, pasta, veg meat sauce, bechamel sauce topped with the grated cheese. 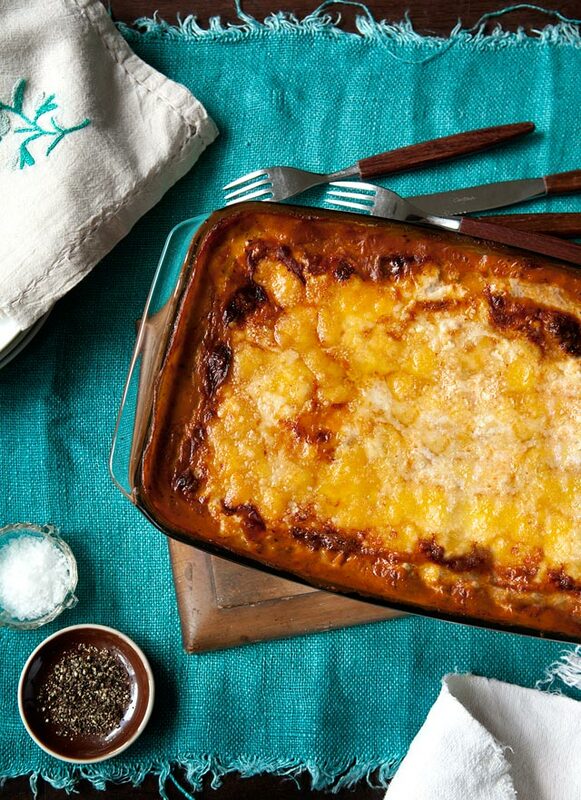 Bake for 45 minutes until the cheese on your lasagne is all bubbly and golden. I recommend letting the lasagne sit for at least 20-30 minutes before slicing into it. *Freezing notes: even though this is a gluten-free blog I thought I’d mention that you can use wheat based pasta if you wish, and your lasagne will freeze beautifully however I don’t recommend freezing gluten-free lasagne as I find the pasta sheets disintegrate when reheating. Photography and styling notes: I have a thing for Pyrex, especially vintage Pyrex. I also like Fire King from the USA and I particularly like vintage Schott pieces from Germany. I never used to think much of it and actually used to scoff at my own mother’s collection, but in recent years have come to absolutely love the stuff and my collection has grown. I am on the lookout for it regularly in charity shops and garage sales in the hope of finding vintage pieces in near perfect condition. In the shoot for this recipe I’ve used a vintage Pyrex dish sourced at my local Salvo’s along with a bunch of other vintage props also sourced at local op shops (Goodwill’s and thrift shops for overseas readers). The plate in the slice shot is the Country Road breakfast plate and the background is my coffee table. The only light used in these images is daylight. Camera used is a Canon 5D Mark II and the lenses used are a 24-70mm zoom and 100mm macro. I loved Robs as well! There seems to be some confusion on the net as to what ‘revolved’. It was the bar. Not the entire restaurant. Best thing I have ever done for my grandkids, nearly complete and I can’t see the vegies. They will be getting this lasagne from me every week. Fabulous.